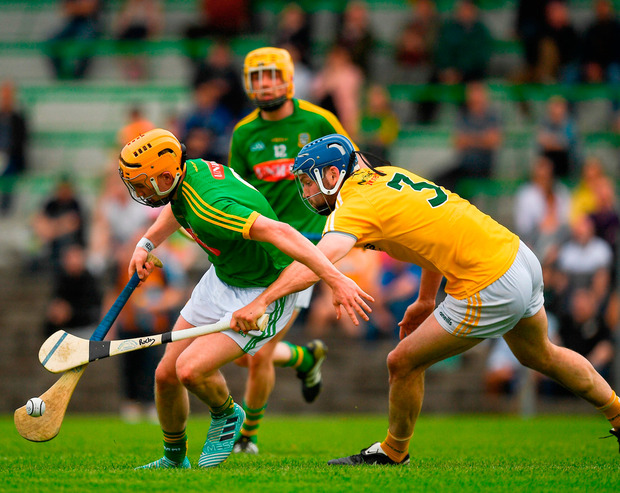 A remarkable 23-point turnaround saw Antrim overcome Meath at Pairc Tailteann. In arrears by seven points after 20 minutes, The Glensmen outscored Meath by 5-18 to 0-10 thereafter. It gives Terence McNaughton and Dominic McKinley something to build on over the remaining four round robin games. Antrim put the poor start behind them with significant scoring contributions from three sources. Neil McManus got the revival going with points. He also created the opening for Antrim's first goal, finished with aplomb in the 21st minute following a fine turn of pace by Nigel Elliott. Elliott finished with 3-2, all from play. His second and third goals came in quick succession around the 48th minute. Conor Johnston was Antrim's other major scoring contributor with 2-4. His second goal from a penalty, the last act of the game. 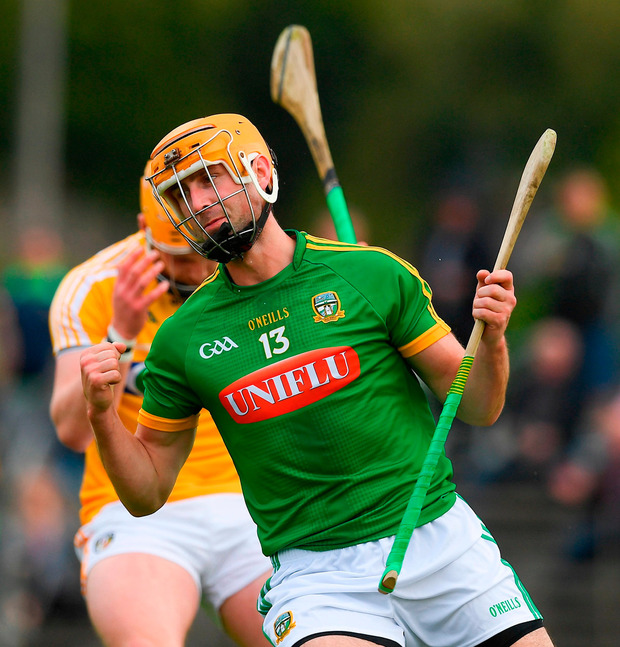 Gavin McGowan and Alan Douglas got early goals for Meath. By the end, Antrim had 10 different scorers from play. Meath had six, with half of their total credited to Jack Regan. Scorers - Antrim: N Elliott 3-2, N McManus 0-8 (7fs), C Johnston 2-4 (1-0 pen), S McCrory 0-4, D McKinley, J Maskey 0-2 each, C Carson, M Armstrong, C McCann 0-1 each. Meath: J Regan 0-12 (8fs), G McGowan 1-2, A Douglas 1-1, P Conneely, S Quigley, C McCabe 0-1 each. 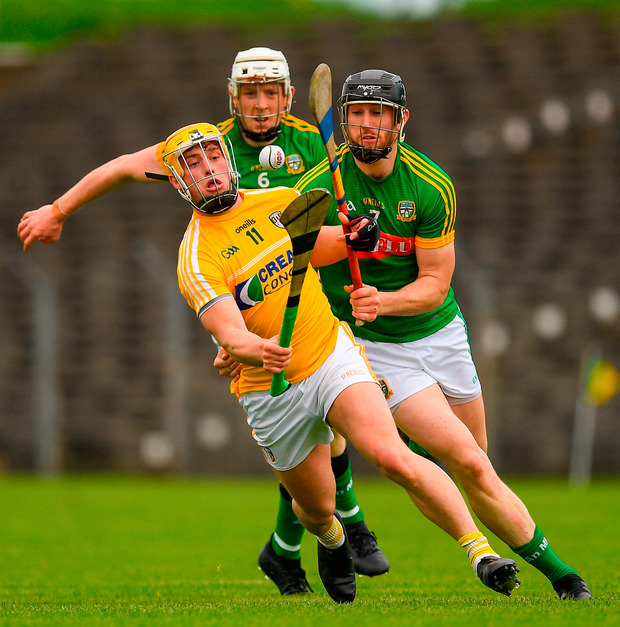 Antrim - R Elliott 6; D Kearney 7, J Dillon 7, R McCambridge 8; P Burke 8, C McKinley (C) 8, J Maskey 7; N Elliott 8, S McCrory 7; C Carson 6, C Johnston 8, N McManus 8; D McKinley 7, M Armstrong 6, E Campbell 6. Subs: C McCann for Armstrong (bs 15-18), C McCann 6 for Carson (ht), J McNaughton 5 for Campbell (56), S Rooney 5 for Kearney (57), M Donnelly 5 for McCambridge (66), O O'Neill for McKinley (69).